I am pretty open about the fact that I have Obsessive Compulsive Disorder (OCD). I was diagnosed when I was twenty, but it something I’ve been dealing with a lot longer than that. I think probably from around aged ten or eleven. It affects my life daily, and influences a lot of things I do. In other words, I get a thought (and it’s usually a grim one) and then I have a behaviour to deal with that thought. Usually the thought will go on, and on, and on and I’ll analyse and perform the behaviour. Then the thought comes back, and I’ll do it again. Then I’ll beat myself up and obsess about why I thought that in the first place. It can be exhausting, and I am lucky that my OCD is pretty mild, and most of the time I can manage it these days. 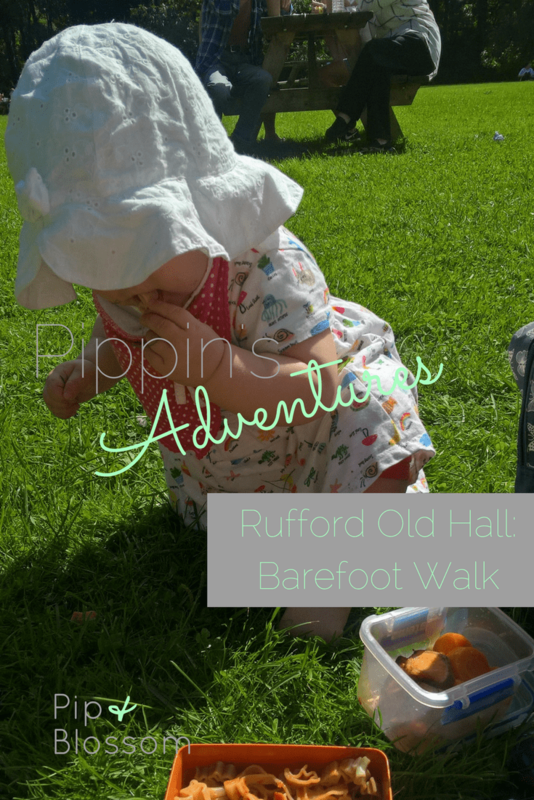 So, naturally, when my friend invited Pippin and I on a Bare Foot Walk at Rufford Old Hall, I immediately began thinking about everything her little feet could come into contact with on the grass. I also just as quickly said yes. Bare Foot Walking is a form of sensory play which basically does what it says on the tin: you walk outside with no socks on and feel the floor. I don’t like Pippin to miss out on any experiences because I don’t see things in the same way as other people, but the idea of letting her walk outside with no shoes felt a little bit sickening. But I packed up her bag and off we went to Rufford. Rufford Old Hall is a five hundred year old property run by the National Trust, set in small(er) grounds that include and Orchard, Vegetable Garden and canal. Part of the ’50 things to do before you’re 11 3/4′ the Bare Foot Walk was a series of trays with different materials in, so one had logs and pine cones, one had grass clippings, one had sand, one had cut up kitchen sponges (Pippin hated that one) and the last had water. So far so good really. I could absolutely cope with bare feet in a contained environment of plastic trays. Then we sat on the floor to picnic. The girls were bouncing off each other, crawling and walking off. Pippin was pulling up tufts of grass and putting them in her mouth, they tipped the pasta I had made for lunch on the floor, then tried to eat that. But I didn’t completely lose it, just removed the pasta from reach and we carried on. As we left the Orchard I put Pippin’s little shoes back on to let her walk, my friend let her daughter go bare foot. Poor Pippin was desperately trying to pull her shoes off and let her feet go free. So, against my OCD’s judgement, I let her. 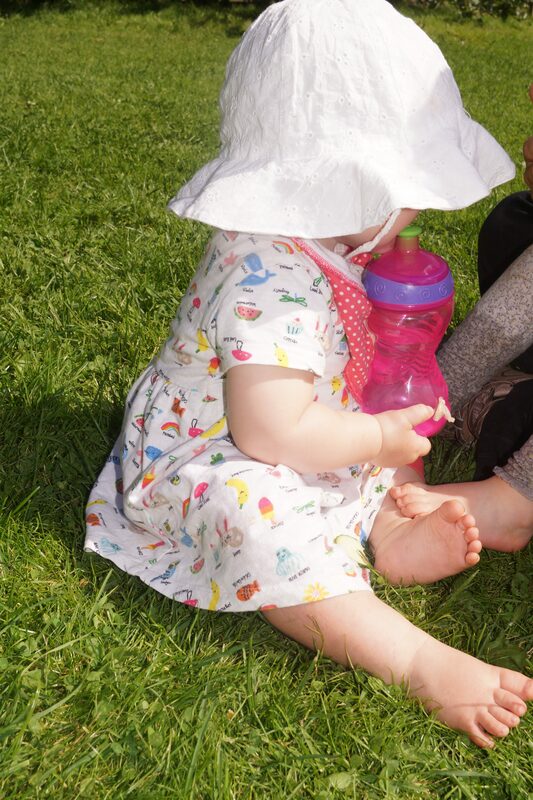 Her little face when she put her bare foot into a muddy puddle was a picture. She whipped her foot out so quickly and stood on one leg. Then she watched my friend’s daughter splashing happily and she jumped in. She loved it, and I loved seeing her so happy. Of course I gave her a lovely soapy bath when I got her home, but I did it. Allowing her to put her feet in that puddle was as big an achievement for me as it was for her to put her feet in it! And I couldn’t be happier that I let her have that experience.